Brief Guide to Life Jackets. From auto inflatable life jackets to foam type life jackets, from life jackets for children to life jackets for your dog - your SVB online shop offers you a wide range of different life jackets from different brands at excellent prices! Your life jacket purchase. Unpack the nautical life jacket and read the instructions carefully. Assemble your life jacket and adjust the straps according to your height. If the jacket does not fit, we also offer life jackets in bigger sizes. Open the protective covering of the life jacket side and look at the mechanism and the inner workings of your life jacket. We advise you to always carry a replacement set of jackets on board. We do not recommend automatic life jackets for your little sailors on board under 3 years who cannot swim yet! There are special children's life jackets made out of foam. Of course, a life jacket for your dog should not be missing. SVB offers various dog life jackets at competitive prices. Automatic vests are engineering products. A variety of components must be checked and serviced at regular intervals. These are: the trigger mechanism, the swim bladder as well as the belt and locking system. All life jackets sold by SVB uncompromisingly meet the highest safety standards and are produced by internationally renowned manufacturers such as Secumar and Kadematic. Based on the buoyancy class pictograms, the suitability of a life jacket for various applications and needs can easily be identified. This classification is subject to general European standards. 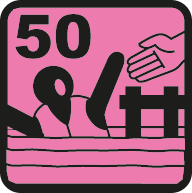 50 N Swimming support: Only for good swimmers in a short distance to the shore, aid around, not fainting proof. 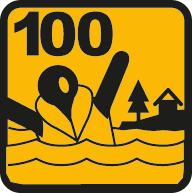 100 N Life jacket: Only for well-protected waters and inland areas, limited fainting protection. 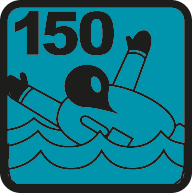 150 N Life jacket: Inshore and offshore waters - however, limited support for heavy protective clothing. 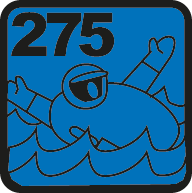 275 N Life jacket: Offshore, commercial vessels under extreme conditions, fainting proof in almost every case.